Rejected after one mind-blowing night, Maisie kept her pregnancy a secret. Now, Antonio’s determined to claim his daughter. But their connection reminds Maisie that she still has to protect her heart — because billionaires don’t wed waitresses…do they? Restoring his family’s legacy is all that’s important to Matteo. Yet when Ruby confesses she’s pregnant, Matteo demands his child. But with the heat still burning between them, can Matteo ignore his desire for Ruby too? Facing an arranged marriage, runaway Princess Olivia pleads with billionaire bodyguard Roman to allow her just one week of freedom. But secluded on his private island, their forbidden attraction is explosively undeniable! 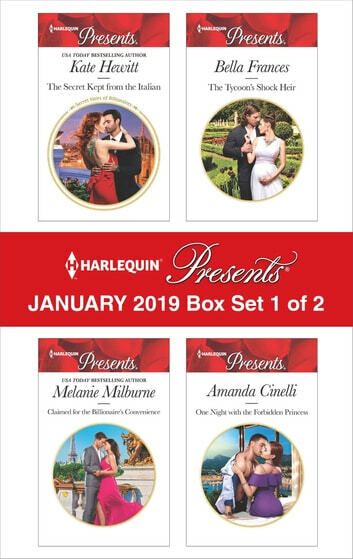 Be sure to collect Harlequin® Presents’ January 2019 Box Set 2 of 2!